This is the text, slightly edited, of my eulogy for Peter Jankowsky at his funeral in St Laurence O’Toole church, Kilmacud on 24 September. Peter was 75. He died at home quite suddenly on the night of 17 September. In the introduction to his book Myself Passing By, Peter wrote this sentence. 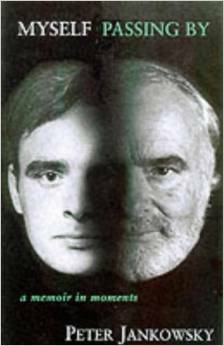 ‘Perhaps one is even a different person in another language.’ The thought is profound but the explanation is simple: he was a German writing in English who discovered a foreigner in himself, a person hitherto unknown to him. Who was this unknown, this second person? And who was that first person who spoke only German? Now that he has become his past, the answers to these questions are taking on a single final shape. The problem in this short space of time is to say anything about the complexity of Peter’s character and accomplishments. Impossible to describe here the actor, teacher, writer, broadcaster, photographer, the nature lover, the translator, the private poet, not to mention the gentle man. The best I can do in these circumstances is to concentrate on the difference between the German Peter and the Irish one. In Germany he was a professional actor, strikingly good looking, intense, talented, the makings perhaps of a great Hamlet. In Ireland he didn’t act, and it can only be fate that he was chosen to play the Nazi spy Dr Hermann Goertz in the RTE television series ‘Caught in a Free State’. RTE was looking for the best actor in Germany to do the part, and they were willing to pay top dollar – they had already hired a number of outstanding German actors for lesser roles. You can imagine then their reaction when Peter, who was translating the scripts, let it be known, sotto voce, that he was an actor and could play the part. A complete unknown becomes a star overnight. It was, and is, a fairy tale. Instead of pursuing fame Peter returned to being an inspirational teacher in the Goethe Institute and more or less confined his acting to one-man shows, the most recent of which, on the trial and execution of Socrates, he performed in June – there is a Youtube video of it which I recommend to you. The performance is prophetic. When Socrates says death must be a blessing he does so in Peter’s voice. Why did he give up full-time acting? The answer is complicated, but I think it may have been because he was too solitary for the theatre. He had what he called ‘a deep conviction of the enabling nature of loneliness’. The common tragedy of the actor, that he can create somebody else only briefly, was reversed in Peter: that somebody else was always himself, though in his early life who that character could be was in doubt. This is where Ireland comes in. Peter first came here in 1957. He, but not his father, had survived the war. He remembered at the end of it – he told me this once – sitting against a wall in the sun and being too weak from hunger to stand up. But when that famished child grew to be an 18-year-old schoolboy and arrived in Ireland what did he find? Why, he found himself, and he was filled with what he described as ‘an intoxicating sense of liberation’. The next time he felt that same freedom and freshness was when he wrote down – in English – the memories that make ‘Myself Passing By’ such a memorable book. The foreigner was at home again. Peter was, of course, too much of a realist to go on thinking that the Ireland of his first love was the real Ireland. And yet when I look at the photographs of Clare Island in ‘Easter Snow’, the second book we made together, I see a beauty that the stranger knew before me. I think then, too, of how the photographs are presided over by the generous spirit of Bernie Wynter, Peter’s great friend on Clare Island, and I feel sure that there is not always an unbridgeable gulf between the real and the ideal. So the transition from German to Irish was vital in Peter’s pilgrimage as it is, though very differently, in the pioneering journey being made by his wife Veronica Bolay through the art of painting. The irony was not lost on them that their beloved son Aengus has turned out to be a citizen of the world, and their twice beloved grandaughter Mila has a Russian mother and is completely at home in New Zealand. Continents divided them but transition and translation are near neighbours, at least in sound. That is how Peter and I grew close to each other. We spent years working on turning just 65 poems by Paul Celan into English, published by Raven Books in 1985, and a further handful of particularly difficult poems in the magazine Krino. It was an almost impossible task, especially because Peter insisted on absolute accuracy, or as near to it as we could get. I never had as hard a taskmaster, or one I learned as much from. Paul Celan was a Jew whose family had been destroyed in the Holocaust. Because of that history he wrote a kind of unheard of anti-German, desperately difficult to understand in any language. But his life depended on being understood and being simple. So did Peter’s. But Peter did not, as Celan did in 1970, take his own life. Instead – and he soon realised that this was a funny thing to do – instead he came to live in Ireland in 1971. Actually, as well as the freedom, it was the funniness of the country that was for him its saving grace. Let me say one more thing about Celan and Peter. As Celan’s fame as a great artist spread throughout the world, Peter moved away from him. It was not that he thought less of Celan’s work but that he outgrew Celan’s despair. As a proper student should do, Peter went beyond his teacher. Celan would say, ‘Death is the master of Deutschland’. Peter would not say it. In the last year or so Peter seemed to me, looking back now, to be preparing himself for death. He did this by getting rid of unimportant stuff, even stuff he liked. When digital TV came in he threw out his old analogue set and didn’t bother to replace it. No computer of course, no internet, no iPhone – he had enough of an I already, and as for a phone Aengus says he never really got over the loss of the one he could dial. The touch tone model was too quick. Peter liked to go the round about way, at a walking pace, keeping an eye out for birds, wild flowers, things to eat. At about this time each year he would come to the house where I lived in Killiney and take me to a stretch of the beach to pick what I think is called buckthorn, a tiny yellow fruit, very bittersweet, very delicious, but unknown in Ireland. Peter knew about such things. He thought about them. As for the idea that one is perhaps a different person in another language, Peter, long before he died, had made the transition from German to Irish-English and left such a vain difference behind him. He was not to be defined by nationality, or even by language, much as he served the purposes that language and art make possible. He is, instead, defined by his character. One of his friends, the writer and broadcaster Ray Lynnott, in an email he sent me when he heard the news, described Peter as ‘Great-souled’. That is true. He had, he was, a great soul. There is a proverb in Irish, Ní bheidh a leithéid arís ann, there will not be his like again. It’s a true saying, but we incline to forget that it is aimed at the future. Why else say it, if the future is merely empty of his presence? That cannot be. Those of us who knew and loved Peter are left with a feeling of obligation, a feeling that we are obliged not just to remember but to ensure his past has a continuance. Peter wasn’t given to such moralising, or to imperatives of any sort. But Paul Celan was, and so I end repeating one of his orders, which Peter translated and lived, and which can now be heard as his voice instructing us. He was at least two people and he made himself one. The poem is Anabasis, which Peter and I translated in 1983, twenty years after it was published in Celan’s book, Die Niemandsrose. ‘Anabasis’ means a journey from the coast to the interior; the Latin unde suspirat cor means ‘from where the heart sighs’; the spelling of the last word is deliberate. impassably-true Upwards and Backwards into the heart-bright future.